Beauty surrounds me. Seeds that sat in the dry and parched earth had their long drink and now cover the trails with a profusion of pinks, blues, reds, purples, yellow and white flowers. From tiny to large, from native to escapees, invasive or not, the coastal hills are verdant green with willful grasses and tenacious flowers. It is hard to do any clay work. My eyes just want to take it all in and keep it in my heart, this truth before me. 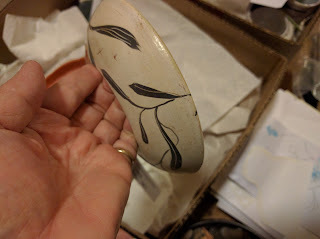 The first three photos are wall hangings---wheel-thrown bases and then free-handed painting using terra sigillata and clay ink. Inspired by the enchanting forget-me-nots that are everywhere here, I decided to do these quickly and simply. Forget-me-nots are not native, but rascally run-aways and considered only mildly invasive. Their hairy seeds catch rides on anything that brushes against them and travel to new locations. Once they settle in it takes two years before they bloom. They like dapple sunlight found in the redwood forest here, mixed in with the ferns and wild geraniums they make the trails look as if tended by a master gardener. Nice to see you back to blogging again; I had taken a bit of a hiatus and now have to launch into high gear to fill my booth for the farmer's market next month. If I let myself I could immerse myself in nature and never leave but other priorities sometimes propel themselves to the forefront. Love your wall hangings and would love to see them on a wall. Wondering what is clay ink? Hope you are doing well in your new location. Beautiful post - forget me nots are one of my favorite flowers! Your wall hangings are wonderful - love the line-work. I'm sure you must be grateful for that rain! and the beauty that ensued! I also love bachelor buttons. They don't grow wild here. When I was 6 we lived in Tacoma, Washington and we had a wild field behind our house with buttercups and bachelor buttons. It has stayed with me and I can still see it as clear as day.